160611: If I remember correctly, one of the Spanish newspapers published an almost "fresh" photo of at least three tugs trying to wedge themselves in to try and get the ship to right itself. Obviously the centre of gravity was such that to achieve even a partial uprighting, there would have had to be a contra-push from the other side. Indeed, it is possible that the action of the tugs again altered the CoG. Thereafter, slowly but surely she started slipping down as the first containers came off. These were not the planned removals but rather the containers that were half on the ship and half on the quayside plus any other part of the upper-works that worked loose. Any minor alteration would have thus ensued in the ship changing its original "sloped" position. 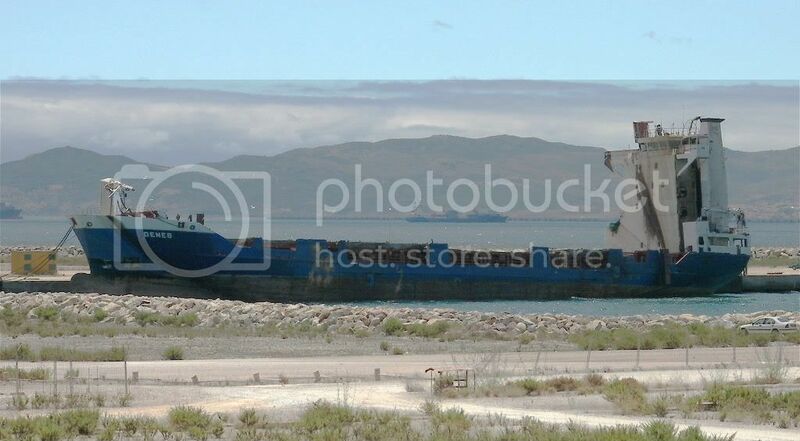 On the 13th july works started to right the stricken container ship DENEB in the port of Algeciras. Two large cranes on the wharf were tasked for this job. The cranes arrived from Seville onboard 30 trucks. By the next day the ship was nearly upright as can be seen in the following photos. By the evening she was floating on her own. On the 19th she was towed to the shipyard at Cernaval just across the bay. Nice set Daniel, Thanks for that!! Thanks to both of you for the update, I was going to ask if there had been any progress. The container ship DENEB was towed out of the bay by the tug SERTOSA DIECIOCHO on the 12th August and is now on its way to Santander, expected there on the 20th.